Patagonia is home to some of the most spectacular landscapes on earth, full of emerald lakes fed by icy glaciers and towering mountain ranges home to guanaco and vicuna. End your day with a glass of malbec surrounded by the region's towering scenery. With an extension to Iguazu Falls, this trip encapsulates Argentina's most iconic locations. Join tour Buenos Aires and check-in to our hotel. Here we find ourselves in the midst of Argentina's vibrant capital, located on the southern shores of the Rio de la Plata. Since its founding by Pedro de Mendoza in 1536 the city has thrived on trade and its vibrant streets are filled with an eclectic mix of European architectural styles, with Spanish, French and Italian classicism rubbing shoulders with remnants of Victorian grandeur. Gaining independence from its Spanish overlords in 1816 the city grew to rival the great cities of Europe, its wide avenues and elegant squares earning it the title of the Paris of the South. Today we will take a tour of the city, exploring the major landmarks around the Plaza de Mayo, site of the famous mass demonstrations by supporters of Juan Domingo Peron in 1945, organised by his wife Eva. We'll also visit the elaborate mausoleums of the famous Recoleta Cemetary, the final resting place of some of Argentina's most revered figures, including Eva Peron herself. Our tour will also takes us via Palermo Park and the colourful vibrancy of La Caminito in the La Boca district of the city. Settled originally by Italian migrants, the area is famed for its colourful houses and lively street performers. You can even come across the tango being performed on some street corners, highlighting the city's connection with this most Latin of dances. This evening we have an opportunity to enjoy something of Buenos Aires' dazzling nightlife and soak up the pulsating rhythms of one of South America's most captivating cities. Today we transfer to the airport for the flight to Ushuaia, the world's southernmost city, spectacularly located on the Island of Tierra del Fuego at the very tip of the South American continent. Depending on the flight times, you may be departing in the very early hours for your internal flight. Beyond this remote port lies the Beagle Channel and then the open waters of The Drake Passage, where the deep rich waters of the Atlantic and Pacific Oceans converge amidst some of the most challenging seas on earth. This afternoon is free, flight time permitting. You may explore this remarkable city at the end of the earth and visit the Maritime Museum, housed in what was once the prison, to learn a little something about the harsh realities of life on these unforgiving oceans. Alternatively you can take a half day trip out into the Beagle Channel itself to experience a little something of the power and majesty of these southern oceans or visit Harberton Estancia to see the Penguins. A trip to the nearby Glacier Martial affords some superb views out across the Beagle Channel to the Chilean islands beyond (weather permitting). 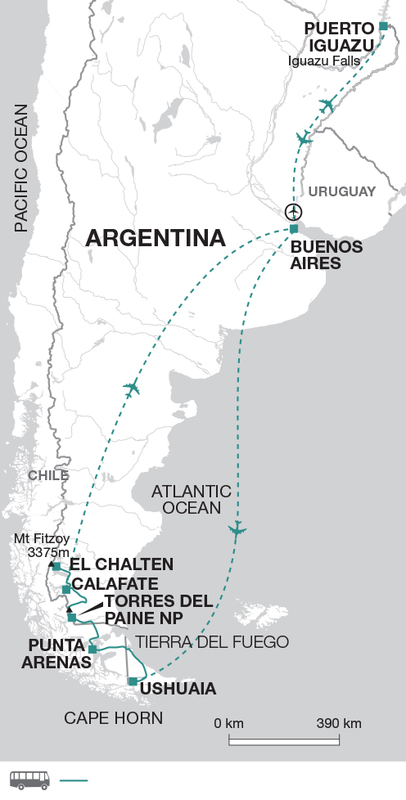 NB - depending on the flight times to Ushuaia breakfast will be taken either at the hotel in Buenos Aires or in flight. The optional excursion to see the penguins is often very busy, and in peak times we may pre-reserve spaces for the group. If we are holding spaces, your Tour Leader will ask people to decide, book and pay shortly after your first briefing on Day 2 of the trip. Tierra del Fuego translates as the Land of Fires and today we have time to explore the nearby national park. Separated from Patagonia by the waters of the Magellan Strait, Tierra del Fuego is a landscape of lakes, forest and tundra, set beneath an imposing backdrop of ragged mountain peaks. This morning we take a leisurely walk along a forest trail to Lapataia Bay, taking in the expansive views and hopefully coming across some of the abundant wildlife in the area. These peaks and valleys, filled with Lenga and Guindo trees which provide a rich haven for Patagonian grey foxes and condors . After lunch we return to Ushuaia and have a free afternoon to further explore the area. After breakfast this morning we depart by public bus and spend our day travelling across Tierra del Fuego, crossing the Magellan Strait by ferry and entering Chile, to complete our journey to Punta Arenas later this afternoon. The journey takes approximately 10 hours including the ferry crossing. One of the largest maritime settlements in the region and the first Chilean settlement along the waters of the Magellan Strait, Punta Arenas was founded in the mid 19th century, beginning its life as a penal colony and growing rich on sheep ranching and (before the opening of the Panama Canal) the vital facilities that it offered to shipping traversing the dangerous routes through the southern oceans. Tonight we will have a chance to enjoy some local specialities, such as king crab, and perhaps sampling some of the excellent Chilean wines before retiring for the evening. meaning blue, apt acknowledgment of the striking turquoise lakes that abound in this astonishing place. Our dramatic drive takes us via the Milodon Cave to our accommodation in Torres del Paine. Included in the trip is a full day of fairly easy hiking and lookout points, as we don our walking boots and take on a comfortable 8km wildlife hike from Lake Sarmiento to the Laguna Amarga. At first the area seems barren but it is home to a wide variety of flora and fauna. It's not unusual to see large numbers of guanacos here, as well as black-necked swans, upland geese and pink flamingos. We may even be fortunate enough to spot condors, or even the elusive puma. There are also more than 20 sites of ancient cliff paintings approximately 6000 years old along the trail. We continue by vehicle to the Cascada Paine, a stunningly situated falls under the backdrop of the jagged peaks of the Torres. From here we continue to drive to the Blue Lagoon, where we stroll around the beach to admire the Towers from the same view that inspired Lady Florence Dixie to call them 'Cleopatra's needles' in her book Across Patagonia in 1880. For those who prefer something more challenging, you have the option of undertaking the 22km trek to the base of the Torres del Paine. The hike culminates in one of the most impressive lookouts in the park, over the spectacular Torres - imposing pinnacles of sharp granite that rise up over 2600m to pierce the sky. The entire hike is full of breathtaking panoramas as you pass by glacial lakes, river valleys and mountain forest. If you would like to undertake this trek, your local guide will need to know by day 2 of the trip, in order to ensure that a guide is in place for you. Please also note that the Torres hike is not included, whereas the day exploration is. On our second day in Torres del Paine, we will start the day with a visit to a viewpoint where we will enjoy stunning panoramas of Lake Pehoe. Next, we will head to Mirador Cuernos where we will see views of the Valle del Frances (approximately 2 hours walk). In the afternoon, there is the opportunity to take an optional zodiac trip on the Serrano River to witness the Serrano Glacier. For those not interested in the boat trip, other options include walking to the Claudio Lagoon or to the Nuria river. (both walks are approximately 2 hours). After breakfast we depart for the Argentinean border at Cerro Castillo, crossing the vastness of an empty, treeless plateau, where the only signs of life are the occasional estancia sheltering behind a windbreak of rare trees. Our destination is Calafate, situated on the southern shores of Lago Argentino, an unassuming little community that has been declared the national capital of the glacier region and the gateway to Los Glaciares National Park (approximately 6 hours drive). Today we have a full day visit to the awe-inspiring Perito Mereno Glacier, a highlight which ranks as one of South America's most magnificent sights and arguably one of the world's greatest spectacles. Fed by the vast expanse of the Southern Patagonian Ice Field, the glacier covers some 250 sq km and presents us with an impressive list of statistics. It stretches of over 30km and at its deepest point is over 700m thick. It is advancing at a rate of 700 metres per year, but is estimated to calve off great chunks at probably the same rate, meaning that it has remained pretty much stationary for nearly a century. All in all it is a natural masterpiece of quite spectacular majesty. Whilst at the glacier, there will be the chance to either trek on the ice (an age limit of 65 years applies due to National Park regulations) or take a boat ride to get closer to the glacier face. Today we drive to the picturesque town of Chalten (approximately 3 hours), lying at the confluence of the De las Vueltas and Fitzroy Rivers in Los Glaciares National Park. Arriving at approximately 11am we will have lunch before checking in, the afternoon is free to explore the town and its surrounding trails. You will have the option to visit the Huemul reservation, a private pristine reserve 16kms from Chalten, with numerous trails to explore. Although you don't get the spectacular views that you have come to expect from Torres, the park is beautiful in its solitude and is home to a diverse number of species including condors, foxes and the magellanic woodpecker. Alternatively you may wish to take a trip to Lago Del Desierto; during this 8 hour trip you will enjoy a scenic drive to the lake, followed by a short sail across the lake and a hike up to the Vespignani Glacier lookout. Over the next day and a half we have the opportunity to explore the stunning Fitzroy Massif. Today you may choose to take the option to set out with a local guide, weather permitting, to cover the distance to the base of Fitzroy Mountain, whose unmistakable summit is almost permanently covered in cloud, a phenomenon that was believed to be smoke by the indigenous Tehuelche who named it Chalten (Smokey mountain). The mountain reaches a height of some 3405m and its forests and slopes are home to a unique array of wildlife, including the elusive huemel, a small deer and the majestic (and far from small) condor, one of the largest land birds on the planet. The scale and grandeur of this setting, where the glaciers seem to hang suspended between the jagged peaks, makes this walk a truly rewarding excursion and the return journey will take us some 8-9 hours (approx. 21km). Please note this walk is moderate to challenging due to the distance covered and the type of terrain, there are other shorter walks available on self-guided trails should you prefer or you may take the time instead to relax around the town of Chalten and its stunning surrounds. We have a three hour drive back to Calafate this morning, in time for our afternoon flight to Buenos Aires. The rest of the afternoon and evening is at our leisure, and for those who wish there may be the opportunity to take in one of the city's famous tango shows. Driving back to the airport you will fly (unescorted) to Puerto Iguazu (Argentina), where you will be met by a local guide. During your time here you will get the chance to visit the Brazilian and Argentinean sides of the falls, to witness for yourselves what are arguably the most beautiful waterfalls on the planet. Set amidst the lush landscapes of the Parque Nacional do Iguazú Reserve, the falls are one of nature's true masterpieces, a spectacular cascade of some 275 interconnecting falls that hurtle over high cliffs into a marvellous curved amphitheatre- a breathtaking sight that extends 3km across the Rio Iguazu. Viewed from the Brazilian side the Falls present themselves in all their majestic and powerful glory and the noise is tremendous, with huge clouds of soaking mist being churned up by the cascade. The national park was declared a World Heritage Site in 1986 and its trails are a paradise for nature lovers, the surrounding spray-soaked forest providing a rich haven for some spectacular flora and fauna, with over 2,000 plant species and over 400 different types of birds being recorded here, as well as countless mammals, insects and reptiles. The canopy meanwhile is alive with a rich array of brightly plumaged toucans, parrots, humming birds and colourful butterflies, whilst the forest floor boasts jaguars, mountain lions, tapirs and capuchin monkeys. Please note while staying in Iguazu transfers are not in a private vehicle but may be shared with others. From the Argentinean side of the Falls you can see an altogether more extensive view of this incredible cascade, with the added bonus of generally fewer tourists. A walk to the churning caldron of the Garganta del Diablo (the Devil's Throat) presents you with possibly the most powerful waterfall on the planet, where a series of 14 separate falls merge into one, to produce a spectacular torrent. This morning is left free to relax at the hotel before your return flight to Buenos Aires. A selection of optional activities are listed below to help you budget for your adventure. Whilst the basic tour price you pay before you travel includes a great selection of highlights, we have also built in free time to allow you the flexibility to choose from a carefully selected range of additional excursions and activities, or take time to relax, the choice is yours. Argentina is undeniably an expensive destination to visit, and the costs of these optional excursions do show that. However, please remember that at certain destinations along the way there may be several options to choose from and it may not be possible to fit all the activities in. Day 2 or Day 13: Buenos Aires - Tango Show/Dinner US$ 120, without dinner US$ 70. In Torres del Paine hotel they charge 19% interest on the use of Chilean Pesos. A warm sweater or fleece, good waterproofs and a windproof jacket are all essential. We also recommend bringing waterproof trousers as weather conditions can change suddenly whilst walking. Laundry services are available throughout. Comfortable and sturdy walking boots with good ankle support and tread are essential. Trainersandals for relaxing in. Total allowance for your international flight: 44lb/20kg. Luggage limit for domestic flights is 15kg. You may leave excess luggage at the hotel in Buenos Aires. Binoculars, torch, water bottle, insect repellent, suncream (at least factor 15), good quality sunglasses and a lipsalve with sun protection and walking poles (if you use them). Accordingly you should allow approx. US$ 60 for gratuities for local staff. Chile: Visas are not required for UK, New Zealand, Australian, US and Canadian citizens.